After a quick and easy check-in, we flew out of London Heathrow bright and early on Friday morning. We travelled economy class with British Airways and the service from the BA crew on board was good. Whilst the onboard entertainment was quite limited, it did not matter as it was such a short flight. We were provided with a ham and cheese croissant and a drink onboard. With around a two-hour flight time direct, Bilbao really is an ideal destination for a short city break. We stayed for two nights at the Hotel Melia Bilbao. This is a good 4.5* property and offers a fantastic location. The hotel is located about a 10-15 minute walk away from the world famous Guggenheim Museum and there are plenty of local bars, restaurants and shopping centres located within walking distance. The more traditional area of the city, ‘The Old Town’, is located about a 20-25 minute walk away. We were each allocated standard Melia rooms for the two nights, which were comfortable and pleasant. The hotel has a typical Basque feel about it with dark woods and terracotta colours decorating the property throughout. Breakfast was good, there was plenty to choose from and the service was attentive. Being a Melia property and positioned in a great location, the hotel is very popular with businessmen and women. We spent our final night at the 5* luxury Hotel Maria Cristina. What a real treat this was! Before I left home, I had a quick look at the hotel and the pictures online just don’t do the property justice or show how truly beautiful it is. We were told when we arrived that the hotel had recently undergone a major refurbishment, as before then it was a little bit old and tired. The hotel’s feel is quite vintage (lots of greys, whites and purples), very classy and elegant with beautiful chandeliers welcoming you in reception. We were treated to dinner on the final night. This was served in the Easo Restaurant, which is a stunning room with gold-plated ceilings and glitzy chandeliers (also where breakfast is served). Breakfast was one of the best I have ever had with so much choice. There were omelette and pancake stations, tasty pastries, hot buffet breakfast, exotic fruits and a wide selection of teas from all over the world. On our first afternoon, we were treated to a tour at the world-famous Guggenheim Museum. A top tip for this would be to go later in the afternoon. We arrived at the museum around 3 pm and by that time the long queues of tourists had been and gone. The museum has a Michelin star restaurant inside, so you are able to treat yourself to lunch before touring the museum. We had a guide escorting us around. I found this a great little touch, as it really brought the exhibits to life and enabled us to learn interesting facts about the works, which we probably would never have received if she hadn’t been there. Guides are a chargeable extra and can be arranged by Kirker Holidays, but it is definitely worthwhile doing this. We also experienced the salt pans at ‘Salinas de Anana’. This was probably the only thing about the trip that I wasn’t too keen on. The tour through the salt pans taught us about the history and the traditional production of salt in the region. On route to San Sebastian, we stopped off at Getaria. This is one of the Basque Region’s lesser known coastal fishing towns. The area has an excellent reputation for outstanding cuisine and delicious local wines and we spent time at the Maisor Canning Factory. The factory has a worldwide reputation for anchovies and other local fish and delicacies. We learnt the production process from catching the fish, cleaning, packaging and finally selling on. After leaving Getaria, we stopped off at Talai Berri Txakoli. This is a beautiful winery run by a local couple and here we had the opportunity to taste the delicious Txakoli wines over more pintxos (Basque tapas). We also learnt about the production of their wines and had a tour of the vineyards and the factory with huge vats of wine. Before catching our flight home, we were taken up to the viewing walk on the UNESCO World Heritage Bizkaia Bridge. This was a great experience and definitely well worth a visit, as you can see for miles over the area. 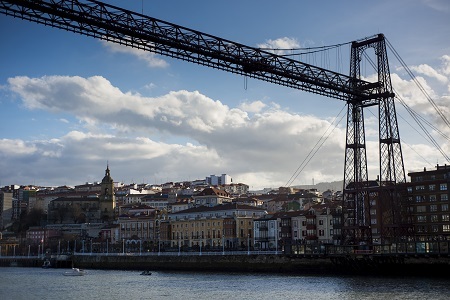 The bridge is located very near to the port of Bilbao. My personal highlight of the trip was probably experiencing the local tasty pintxos on our last evening in Bilbao. The whole atmosphere of hopping from one restaurant to another and picking at various snacks over drinks was great. The pintxos food included squid in ink, Spanish omelette, bread with Parma ham and patatas bravas. To be honest, I can’t pick anything to be improved upon. Everything about the trip was brilliant; it was well-organised and we were very well looked after. I think four days was an ideal amount of time to spend in the Basque region. I would 100% recommend this trip. As previously mentioned, Bilbao is only a two-hour direct flight from London, so it really is ideal for a short city or weekend break. I have explored a few cities over Europe and I have to say I felt that Bilbao was a lot cleaner and safer than other cities I have experienced. The city didn’t feel over-crowded at any time or claustrophobic around key attractions. Kirker Holidays were fantastic hosts. Everything was very well-organised and it was nice that our hosts gave the group time to properly experience the areas we visited instead of rushing around and trying to fit everything in. 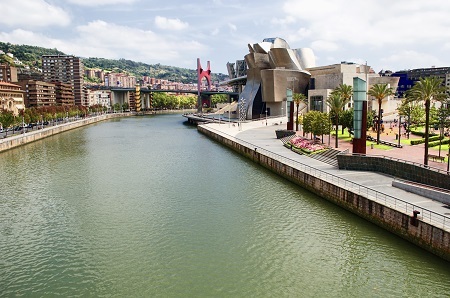 A twin-centre trip that takes in Bilbao and San Sebastian is a great choice, mainly because of the great transport options between the two areas. If you would like to take a similar trip to Spain’s Basque country, we can find you the perfect deal. Drop by one of our East Anglia travel agents or stores on the south coast and speak to a member of the team today.